There are key variables that affect how an acoustic guitar will sound - its projection and tonal characteristics in particular. The guitar’s body dimensions are a big factor and not all guitars are created equally, so there’s no hard and fast rules because manufacturer build and tonewood selections all add flavour to the recipe - big or small, different shapes all bring varying qualities. So here’s the lowdown on spotting the main acoustic body shapes you’ll encounter out there in the wild. While Martin set the blueprint for the dreadnought, 0, 00 and 000 shapes with its models and others followed with variations on them, many companies make ‘parlor’ shapes and things get a little bit murky now in terms of the lower bout widths. These can vary but some are based on the Martin 0 size and width around 355mm (14") - a relatively narrow lower bout - and a depth of around 100- 105mm (3.9-4 "). The tonality here can become boxier and more prominent in the mids. The result can be a natural compression, and if you’re after a more compact guitar, this could be just the ticket. The most common shape you’ll encounter - and regarded as the all-rounder because it usually offers a good balance of bottom end with highs, allowing it to cover a lot of ground for players who need adaptability. It was initially introduced by Martin with more rounded shoulders at the top and a 12-fret body, but it changed to its famous form in 1934. Scale length is usually around 645mm (25.4") with body depth approx 121- 124mm (4.9"). 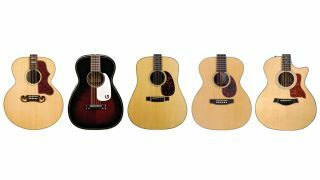 Round-shoulder dreadnoughts are still available from some brands - including the iconic Gibson J-45. Good for: strumming, picking - you name it! Shallower than a dreadnought (see right) at around 105mm (4.1") and narrower in width, the 000 (also known as an auditorium) brings the body closer to the player. As there’s not as much mass to curve your strumming arm around, it feels more intimate and comfortable for stage use too. While losing some of the dreadnought low end, it’s popular for fingerpickers as it’s more likely to have a mid-focussed quality coming through. The OM (orchestra model) has a longer scale length at around 645mm (25.4") compared to the 000’s shorter 632mm (24.9"). Designed by Bob Taylor in 1994 to describe the Style 14 body, this Taylor shape is another all-rounder option. The Grand Auditorium is wider than a Martin-style dreadnought across the lower bout, nearly as deep but with a narrower waist. Good for: strumming, picking... you name it! The big boy of the pack. The jumbo is ideal for players who are performing acoustically sitting down, or are unphased by the larger dimensions. It’s traditionally great for meaty chord work but they are often surprisingly more balanced across the spectrum than dreadnoughts. Still, that bigger body should be good for some deep bottom end. There’s also the smaller jumbos like the Gibson J-185 that has a 406mm (16") body width in the lower bout compared to the original ‘super jumbo’ J-200’s 431mm (17"), favoured by The Beatles and Pete Townshend.